I don’t think one should force themselves to eat certain nutritious foods if they can find an equally healthy substitute. For instance, if you absolutely hate cauliflower, don’t choke some down. There are plenty of other vegetables chock full of nutrients that you might like better. Eat those instead and you likely won’t be missing anything essential! That being said, I do think everyone should at least give foods they don’t like a chance. For one, taste buds change. Just ask my previous self and its hatred for pickles, olives, and guacamole! For another, there are so many different ways to prepare vegetables. As you can see, there are a variety of preparation methods when it comes to vegetables, and there’s a chance you might hate steamed broccoli but love it roasted. Although I’ve long been an advocate for kale chips, I’ve been trying to branch out lately and try it in other ways. I throw it in soups, toss it with sweet potato hash, and now, have a new side dish to add to my kale repertoire. This side dish came together quickly and easily. It’s healthy, but isn’t boring or tasteless, thanks to the addition of sautéed garlic, sun-dried tomatoes, and a squeeze of lemon juice. I bet some sprinkled parmesan would be good on here too! Does the thought of kale chips make you grimace? (My sister Julia thinks they taste like burnt paper) Try this instead! 1. In a large wok or skillet, add olive oil and heat over high until shimmering. Add garlic and cook, stirring frequently, for 2 minutes. 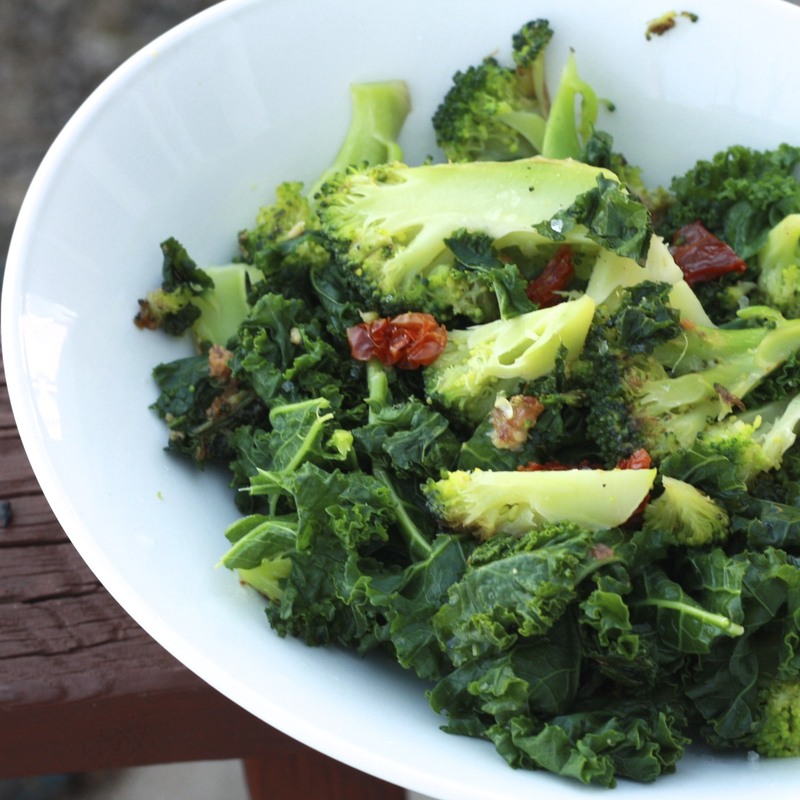 Add broccoli, kale, and 1/4 cup water. Cover and allow to steam for 5-6 minutes, until vegetables are tender (stir occasionally). 2. Remove cover, stir in sun-dried tomatoes and squeeze lemon juice over vegetables. Season with salt to taste and serve immediately.